Andrius Velicka's second-half goal gave Rangers victory in the opening game of the SPL season. Falkirk goalkeeper Robert Olejnik saved well from Christian Dailly in the best chance of a scoreless first half. Rangers conceded a penalty after 54 minutes but Michael Higdon's shot was pushed wide by Allan McGregor. And Falkirk were made to pay for their miss 10 minutes later when Kyle Lafferty crossed for Velicka to score from close range. Falkirk were looking to compound Rangers' misery after the Ibrox club were knocked out of Europe by FBK Kaunas in midweek. But it was the visitors who threatened early on with Lafferty causing the Bairns defence problems on the left wing. Kris Boyd almost had a clear run at goal after four minutes when he latched onto a Velicka pass but Darren Barr made an excellent challenge on the edge of his own penalty area to halt the striker's progress. The home side's first real chance came in the 17th minute when Rangers failed to clear Kevin McBride's dangerous cross and Scott Arfield found Michael Higdon, who fired over. Rangers almost gifted their hosts the opening goal after 25 minutes when captain for the day McGregor mis-kicked Dailly's pass back but Falkirk could not take advantage as the ball drifted away from goal. Falkirk were enjoying the bulk of possession as the match crossed the half-hour mark and Gerard Aafjes sent an ambitious shot high over the bar after a spell of neat passing. Minutes Kevin Thomson capitalised on a loose pass by Falkirk debutant Lee Bullen before driving at the defence and releasing a shot which goalkeeper Robert Olejnik held well. Boyd then sent Lafferty in on goal and, after Olejnik failed to hold, the ball broke back to Boyd, whose shot was blocked by Barr. Rangers continued to put pressure on and Olejnik saved on his goal-line after Lafferty's corner had found Boyd at the back post. Scott Arfield sent a shot from distance over the bar in the last attempt of the first half. 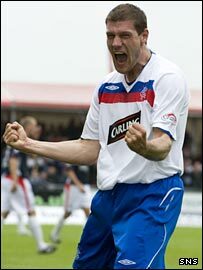 Falkirk were awarded a penalty four minuets into the second half when Steven Whittaker tripped McBride in the box, which resulted in a booking for the Rangers player. Higdon stepped up but McGregor saved well to his left. Falkirk kept up the pressure though and Russell Latapy saw his free-kick deflected wide. Rangers broke the the deadlock after 64 muinutes when Boyd's flick found Lafferty on the right and his low cross was fired into the net by Velicka. The visitors looked to seal the match with a clinching goal four minutes later when McCulloch sent a left-foot shot wide. Dailly then denied Arfield a clear chance on goal with a good tackle inside the box. Minutes later, Dailly crossed for Boyd but the striker's header lopped wide. Falkirk continued to press for an equaliser but Kirk Broadfoot prevented Higdon from getting a shot in with a good challenge. And Rangers held firm to record the three points with Lafferty's deflected shot late on held well by Olejnik. Falkirk: Olejnik, McNamara, Bullen, Barr, Aafjes, John Stewart, Cregg, Latapy (Mark Stewart 73), McBride (Mitchell 90), Arfield, Higdon (Robertson 82). Subs Not Used: McCaffrey, Barclay, Staunton, Gibb. Rangers: McGregor, Broadfoot, Dailly, Bougherra, Whittaker, Papac, Thomson (Adam 84), McCulloch, Lafferty, Velicka (Darcheville 73), Boyd (Cousin 90). Subs Not Used: Beasley, Alexander, Emslie, Furman. BBC Sport Player Rater man of the match: Rangers' Allan McGregor 6.73 (on 90 minutes).